Heat oven to 350F. Spray 13x9-inch pan with cooking spray. In medium bowl, mix 1 1/2 cups Bisquick and 1/2 cup pecans. 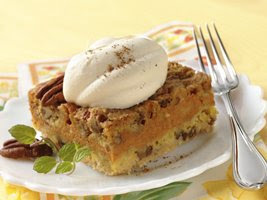 Using pastry blender or fork, cut in 1/2 cup butter until mixture is crumbly. With floured fingers, press mixture in bottom of pan. Bake 10 minutes. Meanwhile, in large bowl, beat filling ingredients with wire whisk until smooth; set aside. In medium bowl, mix 1 cup Bisquick mix and 1/2 cup brown sugar. Using pastry blender or fork, cut in 1/4 cup butter until mixture is crumbly. Stir in pecans. Pour filling over hot partially baked base. Sprinkle topping over filling. Bake 50 to 55 minutes or until toothpick inserted in center comes out clean. Cool 30 minutes before cutting into squares. Serve with whipped cream, if desired. Store in refrigerator. What are you all doing this beautiful Friday? Is it gorgeous weather at your corner of the world? ?